Long recognized by train enthusiasts as an exceptional location to take in the drama of mountain railroading at its best, Truckee is quite a railroad town in its own right. Not only does the Union Pacific's Donner Pass route cut through the heart of this quaint California town, but one can scarcely walk into a storefront or restaurant without seeing the influence the railroad has had on the local culture and history. 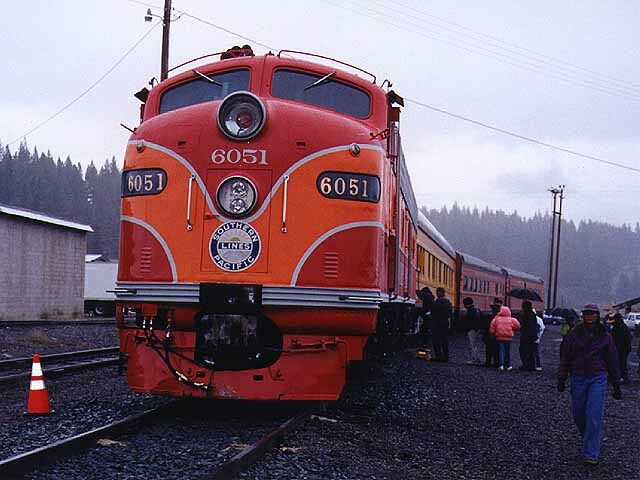 Truckee honored its roots Sept. 26-27, 1998, with a first of its kind Railroad Days celebration. There were static displays of historic and modern rail equipment, games, souvenirs, a model railroad swap meet and dance, among other attractions. Attendance was probably lighter than it could have been due to poor weather all weekend and sparse publicity outside the Tahoe-Truckee area, but we suspect if the event continues it will only gather steam (pardon the pun). 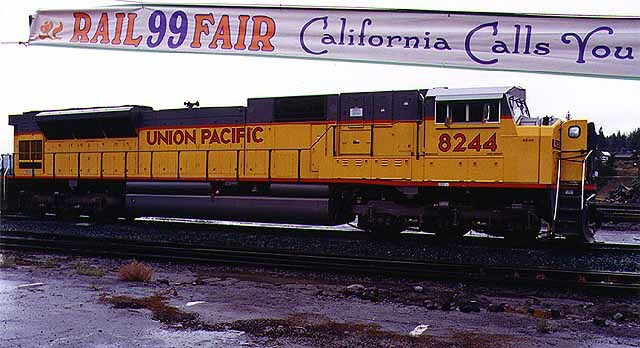 It is more than a mere coincidence that a huge banner promoting the 1999 Rail Fair in Sacramento graced the entrance to the static displays in Truckee yard. The California State Railroad Museum played a major role by providing the Truckee event with displays for the weekend and picked up some good publicity for its planned bash in June 1999. This Union Pacific SD9043AC was not among the museum's display pieces, but it was open for cab tours. Photo by Roni Gehlke. 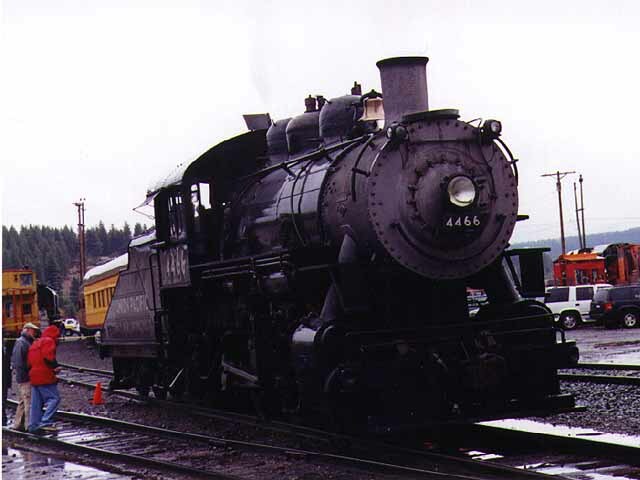 UP 4466 is all steamed up with nowhere to go, but that doesn't bother the hundreds of visitors who brave the rain for a chance to scurry up to the footplate and blow the whistle on this circa 1920 machine, or ask questions of California State Railroad Museum volunteers. Photo by Roni Gehlke. 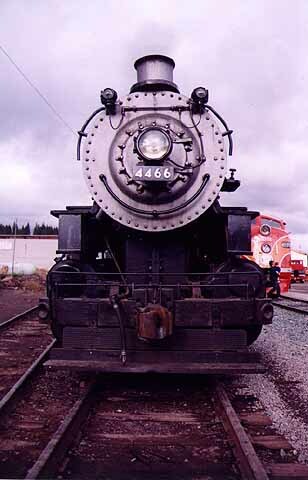 Another view of UP 4466, this one looking east toward the Truckee yard. SP 6051 is visible to the right. Photo by Roni Gehlke. Southern Pacific E9A 6051 brightens up a dreary Saturday afternoon wearing its original Daylight livery and hauling a trio of SP and UP business coaches. Although its engine was humming most of the weekend, this was a static display and no cab tours were offered. Pity. Photo by Roni Gehlke. 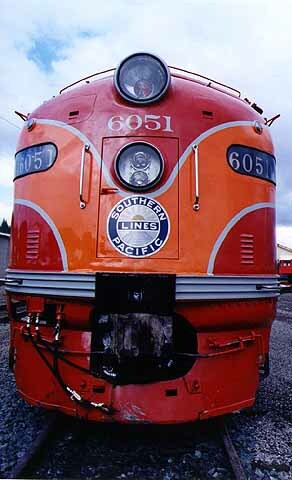 Another view of the 6051shows the detail and beauty of this famous locomotive. Photo by Roni Gehlke. You can't run a railroad in the mountains without encountering a little snow in the winter. 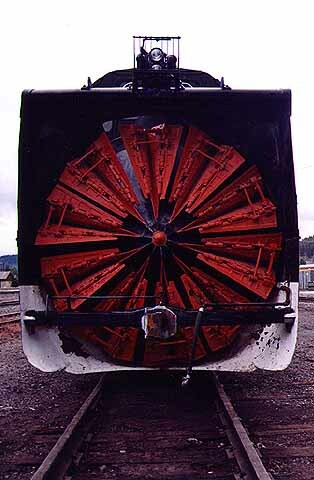 For the Southern Pacific (and now Union Pacific) equipment such as this rotary snow plow is essential on Donner Pass. One of the attractions at the Railroad Days event was a Union Pacific work train featuring this plow, a pair of Jordan spreaders and a work caboose. Photo by Roni Gehlke. Almost as big an attraction as the static equipment displays was the arrival of Amtrak's Train #6, the eastbound Zephyr. The train made a blistering 10 mph as it departed Truckee, no doubt under speed restrictions because of the crowds near the tracks. You could tell the railfans from the casual tourists because all the former immediately stopped whatever else they were doing to get photos. Guess you can tell which category we fell into. Photo by Roni Gehlke. Two can play at this game! 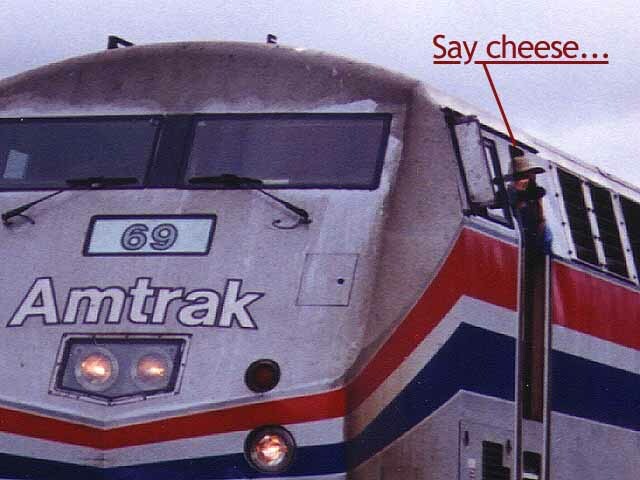 This is the same photo as above, blown up to reveal a member of the train crew who was doing a little railfanning of his own. Guess it isn't every day that you see a steam engine in steam and hundreds of people gawking at your consist to boot. We'd love to see what his prints look like, but we'll probably have to be content with imagining. Photo by Roni Gehlke. 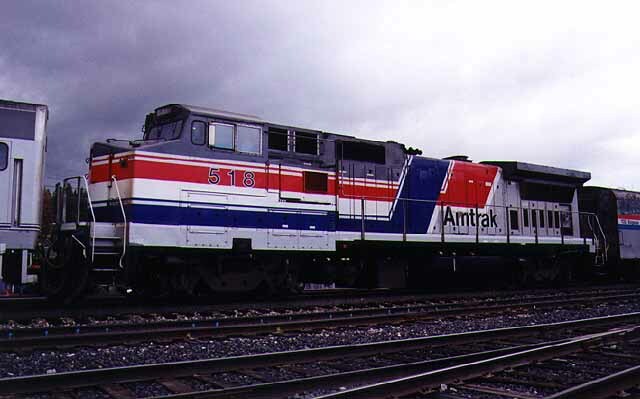 An added treat for us railbuffs, Amtrak 518 puts in an appearance wearing its original "Pepsi can" scheme. This is one of about 16 Dash 8-32BWH units still in use by the railroad nationwide. 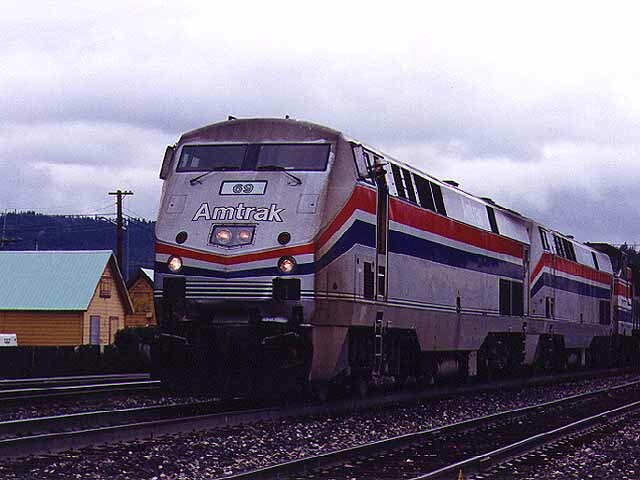 Two of these units (501 and 502) were repainted and renumbered for use on Amtrak California's San Joaquin trains. For a picture of one of them, click here. Photo by Roni Gehlke. This page was last updated Sunday, October 11, 1998 at 10:10 hrs.